Add in a touch more oil if need be and cook the chicken pieces until cooked through. Add the bacon, onion and mushroom mix back in with the chicken, and then add in the carrot, peas and corn mix, thyme and half the stock. Reduce the heat to low and simmer for 5 – 10 minutes until the vegetables are tender. In a separate sauce pan, melt the butter. Whisk in the flour and cook stirring constantly for a few minutes until combined. Gradually add in the remaining stock, and reduce to a low heat and simmer, stirring until thickened. Add the sauce mixture to the chicken and vegetable mixture, and season well. Divide the mix be-tween 6 large ramekins. Would love to try your chicken pie recipe chicken pies are so good! 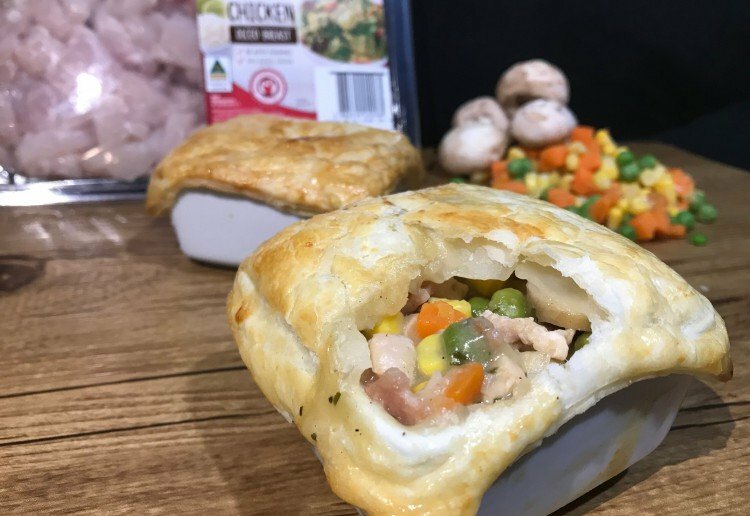 Your chicken pie pots look amazing! A great recipe! love a cheeky pot pie! thanks for sharing! Thank you for providing this, a great mixture. Chicken and bacon in a pie – so good and so satisfying. Like the shape of these pies too – different to the usual round shape. They are satisfying Let me know if you try and like them! I bake on weekends and will let you know! Looking forward to baking day!